The Traditional Havana Brown was originally hybridized in England and later in the U.S. by crossing Siamese, Burmese and Russian Blues. The certainty of how the breed got its name is unknown. One theory insists it was named after the rabbit of the same color. Others believe it got its name due to the fact it is the color of a fine Havana cigar. In any case let’s take a walk through the historical adventure this old breed has taken. Thanks to the Thai people of early Siam, (Now Thailand), there is recorded history of solid brown cats in "The Cat Book Poems" dating back to between 1300 and 1767. These ancient manuscripts were written in the city of Ayudha, Siam between the time the city was founded and before the city was burned by invaders. Seventeen "good luck" cats are described including solid brown cats, which the Thai’s considered very beautiful and had the ability to protect them from evil. Among the first cats to exit Thailand to England in the 1800’s were solid brown cats. In 1888 a self-brown received first place at a show in England. Other early cats entering the British show scene were Master Timkey Brown and his dam, Granny Grumps, who were show in London in 1894. The British Siamese Cat Club gave a special recognition award in 1928 to the cat with "the best chocolate body". They were described as "Siamese with coats of burnished chestnut with greeny-blue eyes" and "Chocolate colored Siamese with the same color all over". During this same time they were exhibited in Europe as well. One of the first to record descriptions of the various cat breeds was Frances Simpson in her book "The Book of the Cat", published in 1903. In it she states, "The best and most definitely colored A.O.C. (any other color) I ever saw was Mrs. Davies’, "Sin Li", a deep, self colored chocolate brown cat. He was supposed to be one of three "Swiss Mountain Cats" imported to this country, and he was a most handsome and interesting animal. Unfortunately, he died young, leaving no progeny." In another section of her book Frances Simpson mentions "solid brown Siamese" or "brown Siamese" with blurry definitions between their points and body colors. The Encyclopedia Britannica 11th. Edition makes mention of a "wholly chocolate colored strain of Siamese." These self-brown Siamese lost favor and were dropped after the 1920’s when the Siamese Cat Club of Britain wrote, "The club much regrets it is unable to encourage the breeding of any but blue eyed Siamese." The all brown cats not gifted with blue eyes were summarily banned from competing. 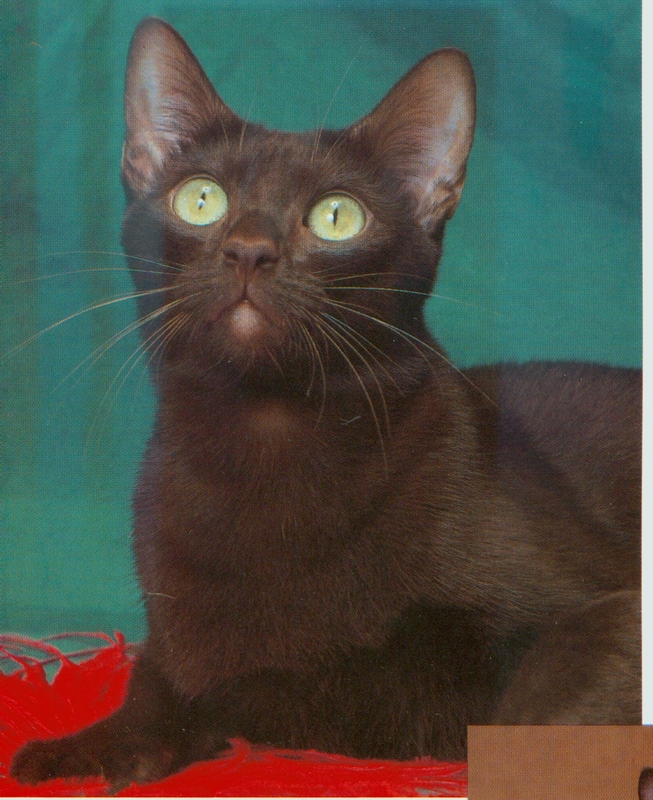 A self-brown Siamese named, Adastra, who lived in 1923, is said to possibly be the ancestor of many Chocolate Pointed Siamese from which the Traditional Havana Brown could have been recreated. Today we know that from these beginnings came the Burmese (the solid brown Siamese described above), the Tonkinese (the blurry brown Siamese), the Chocolate Point Siamese and the Traditional Havana Brown. The War interrupted any cat breeding until it’s ravages stopped. Only in peace did breeders once again begin thinking about breeding again. Purely by chance in the 1950’s in England a breeding done by Mrs. Munroe-Smith produced a Traditional Havana Brown. The mating was between a black short-hair, "Elmtower Susannah", carrying the chocolate gene and a Seal Point Siamese, "Elmtower Tombee", also carrying the chocolate gene. 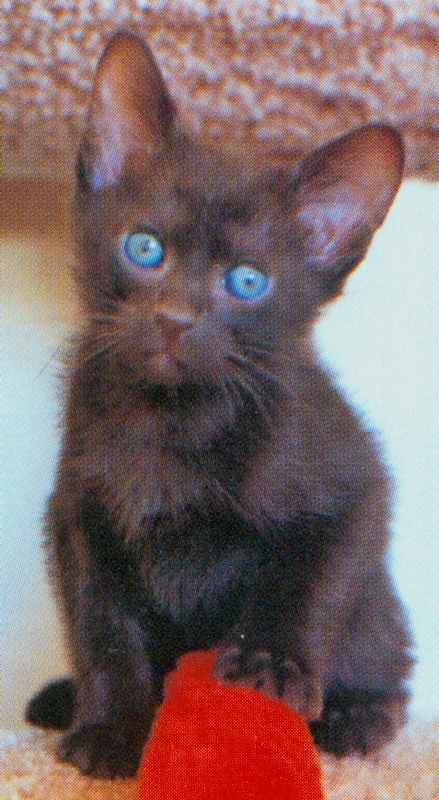 "Elmtower Bronze Idol" (a male) was the resulting kitten who was the first Traditional Havana Brown to be registered in England (1952). He was the predecessor of the re-created breed. Of note is the background of his dam, "Elmtower Susannah", who’s sire was a black domestic short hair named, "Pickles", and her dam was the Seal Point Siamese, "Tsiu Chow". "Elmtower Tombee’s" dam was also "Tsiu Chow", and his sire was "Parkhill Tritone". This doubling up on one cat, "Tsiu Chow" in the pedigree could have caused the end result. One will never know for sure. Real work began in the 1950’s for re-create the Traditional Havana Brown as a breed. "Coat colors which are known to rabbit, cavy and mouse fanciers are only incompletely represented in the cat fancy, although we see no reason why their feline counterpart should not be established," wrote Baroness von Ullmann. Experimental breeding was conducted and published by the Baroness von Ullman of Roofspringer Cattery and Ann and Armitage Hargreaves of Laurentide Cattery in England. These efforts resulted in the description of the color genetics for self brown and its dilute, lavender. Their goal was to achieve the Chocolate Point coloring of the Traditional Siamese, rather than the sable coloring of the Traditional Burmese. In order to manifest the chocolate color a cat had to receive the gene from both parents. The breed name "Havana Brown" was used for the first time. Similar breeding tests were being conducted in England by Mrs. Elsie Fisher of Phraha Cattery, Mrs. Munroe-Smith of Elmtower Cattery, and Mrs. Joan Judd of Crossways Cattery. "Praha Gypka" is believed to be the very first chestnut brown kitten produced through the efforts of these three catteries. The mix used was a black domestic short hair carrying the brown recessive gene and a Seal Point or Chocolate Point Siamese. Once in a while a Russian Blue was used as well. The popularity of the breed spread to the U.S. and inspired Mrs. Elsie Quinn of Quinn Cattery, El Monte, CA. to import the first Traditional Havana Brown from England to the U.S. in 1956. This cat was the female, "Roofspringer Mahogany Quinn". A breeding between "Roofspringer Mahogany Quinn" and "Laurentide Brown Pilgrim of Norwood", also an import, produced the very first Traditional Havana Brown to achieve the laurel of Grand Champion, "Quinn’s Brown Satin of Sidlo". "Sidlo" became a very import cat to the breed in the U. S. because all Traditional Havana Browns in North American trace their heritage back to this one cat. A separation of thinking about the breeds’ progress occurred between the British and Americans. In England the breed tended toward the "Siamese" in type, due to continued out crossing to the Siamese and the word "brown" was dropped from the breed name. North American breeders maintained the appearance of the early imports. At birth the kittens are brown, all brown. Ghost tabby markings are allowed in kittens, but the ideal is a solid color coat free of any markings at all. Whickers must be brown to complement the coat color. Calling all Chocoholics. This is the breed for you. These are for the connoisseur of chocolate, which is their only coloration. Their true appeal comes from their nicely balanced personality, which is not to active, nor are they couch potatoes. They tend to use body language to get their point across. Blessed with a pixyish, soft voice the Traditional Havana Brown usually exhibits the peculiar trait of using his paws to feel, touch, and investigate, items, as opposed to other breeds who characteristically use their sense of smell to investigate curious items. One of their endearing qualities is their typical greeting of elevating and stretching out one paw to touch their human friend, or offer a paw in friendship. These charming cats quietly require human companionship. Affectionately sociable, sweet, and considerate by nature, they are quite, even- tempered, gentle, and intelligent. Most changes are agreeably adapted to with remarkable confidence and poise. They have learned the art of give-and-take. This unflappable breed instinctively molds itself to your habits and is more dog-like in temperament because it seems willing to please. Diversified lifestyles, with children, elderly or all those in between are taken on with style and ease. Traditional Havana Browns crave and thrive on human attention, so be ready to share your household activities with this non-intrusive personality. Some are natural shoulder sitters. Like their Traditional Siamese forebears, they enjoy the game of fetch, and are often seen carrying toys around. Even leash training goes will with them. With eyes that twinkle with curiosity, glow with mischief or narrow to pure contentment, they can captivate you with their permeating, discerning gaze. Expressive ears are almost always in constant motion, taking in their surroundings with great interest. Coming with a short coat, the Traditional Havana Brown is an easy care cat. A once a week brushing to remove any loose hair is all that is needed. With astonishing, mesmerizing, vivid, green eyes, rose-toned nose and rich mahogany colored coat the Traditional Havana Brown is a magnificently impressive, living portrait of deep vivid color and attractiveness. The numbers of Traditional Havana Browns have not been great, since their introduction. The Stud Book for the Traditional Havana Brown was closed to quickly in the breeds development, say some, which has caused a shortage of unrelated breeding stock. Few bloodlines are available. To counter act this problem one association voted to allow the Traditional Havana Brown to be out crossed to black or blue domestic short hairs and Oriental Shorthairs in any color other than pointed, fawn or cinnamon. This decision was supposed to introduce new vigor into the breed. Such breedings have produced healthy, solid brown kittens in the first generation. Because of the occasional Traditional Russian Blue used in their ancestry, once in a while lavender kittens can be produced. This frost gray with a pinkish tone is accepted in TICA and CFF. Since TCA, Inc. represents only the Old Style of each breed, we accept only the original, true brown Traditional Havana Brown.